Merry Christmas! A time of happiness, joy, far too much booze, and of course, eating. Thinking that I would be spending this festive season all by my lonesome (Bah Humbug), I prepared an elaborate plan to stuff myself silly with things I enjoy to numb the fact that I am so far away from my family. I trucked out to Martock Glen Farm, a small scale abattoir and butcher shop just outside of Windsor, Nova Scotia. The Oulton family takes pride in raising its animals “the old fashioned way”, with no antibiotics or hormones, and with access to the great outdoors, grain feed, and green forage. Their products are distributed around the Valley at choice locations, but generally frozen, and a bit pricey. I decided to go down there myself to fill my fridge for a special Christmas weekend of over-consumption. I had a pining for duck. Nothing says self-love than a succulent, rare, fat-laden breast, like duck does. Back in my not-so-single days, I would have regular “duck dates” with my ginger beard man. It was always special, made for excellent post clean-up, digestive cuddling, and filled me with all sorts of warm fuzzies. I craved that feeling and sought out for a whole bird and nothing less. 9am, and Oulton’s was in full swing. Literally, pieces of livestock hanging from big hooks swinging in the meat shop while I ordered my bird and a few other key ingredients. That evening, it being a few days before Christmas, I thought I may as well share my goodies. After all, five pounds of duck is a bit too much, even for me, and tried to entice my new friends to come and feast. Alas, everyone had plans and I ended up chilling out at the farmers’ market for several hours that evening instead of roasting my bird. Another day went by and still I could find no mouths to feed, so on Christmas morning, which seemed to be as good a time as any, I patted that thick layer of fatty skin dry, pricked it all over with a sharp fork, poured boiling hot water over the breast, rubbed a good handful of salt and cracked pepper inside and out and stuck it in a low, poorly calibrated oven to see what would happen. 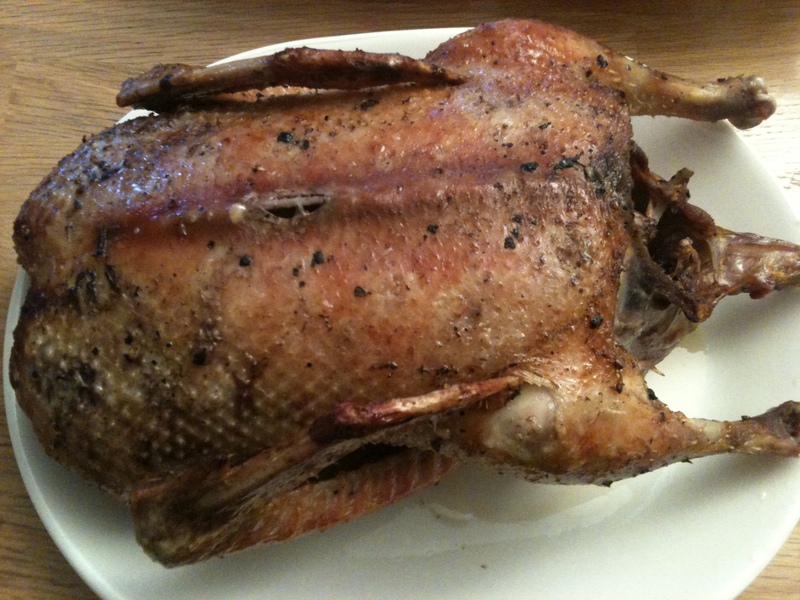 As I caught up on the lives and events of friends from home on the phone, I turned the duck over in its little salty bath every 45 minutes, basted her with icy cold water and fat pooling in the pan, and watched as she became all golden and crispy before my very eyes. I couldn’t wait to sink my teeth into every square inch of her. In the mean time I used some duck livers to make a simple pate with butter and nutmeg, brandy and black pepper, and picked away at blueberries from the freezer. The duck was ready and my little apartment filled up with the juicy aromas as I set her to camp out in an aluminum tent on the kitchen table. Filtering out crispy bits and pieces through cheesecloth, I collected a full cup of fat from the pan, and stuck the crispy bits back onto the range to make a gravy with brandy and chicken stock. As the duck laid to rest, I was invited to join a coworker and her boisterous family for an evening of boys against girls trivial pursuit mayhem, complete with seafood chowder, truffles, cheesecake and a keg of local beer. It was a riot, and I was so pleased to be invited that I even took the duck with me to share. They cleaned the bones dry and loved every morsel. It was a big success and we had a great time. Thank you Salmon-Day gang! You’re the best! 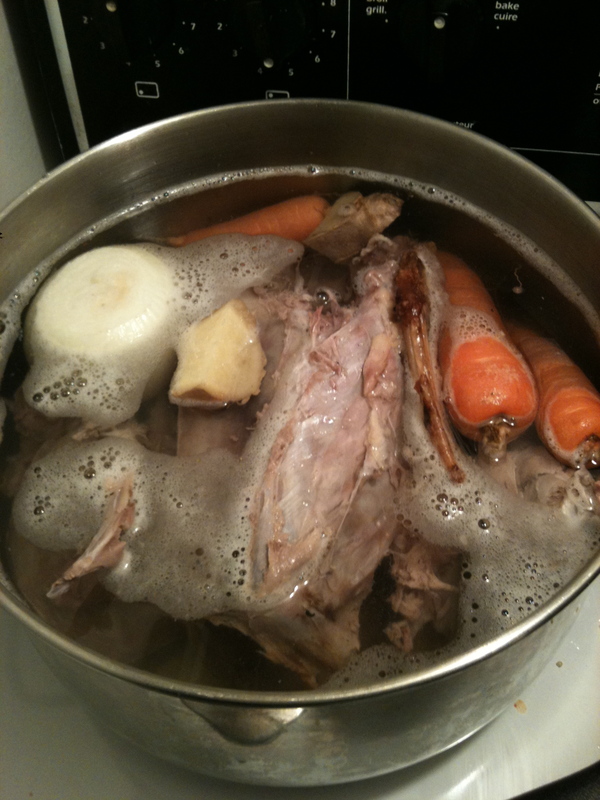 And this Boxing Day evening, the stock pot is bubbling away with the bones and fresh onions and carrots grown by local farmers, allowing for many more meals to be graced by the big flavour of the Christmas duck. There is still a loaf pan full of duck liver pate, and a full cup of pure fat waiting to dance around another pan for the next few weeks. It’s so easy to make more out of what one has. Perspective, creativity and some good recipe starting points is all it takes. My duck did the trick, and instead of the loneliness I braced myself for, I’ve been happily embraced by other people’s families all weekend long. Merry merry to all of you, and a very happy and delicious new year. This entry was posted in Butchering, Cooking & Canning, Events and Life Stories, New Places and Exploring, Recipes. Bookmark the permalink. No Alligator Fritters in the Everglades??!! Large Black Pigs ~ Why heritage breeds matter. Cross-Continental Road Trip! With mushrooms, of course. Market Central, and What’s Glaringly Wrong with the World. Our five minutes of fame… god help us. After the Harvest (Ottawa) Eat. Drink. Connect. Feel Good Food Deciding what to eat, when the decisions seem insurmountable! Well Tailored Cakes and Neckties Food and Words together in one divine place. Orangette Inspiring recipes and stories. Very well written.